As a dietary supplement for adults, mix 28 grams (approx. 1 level scoop) in 8 ounces of water of your preferred source of milk and blend or shake vigorously. Please note the additional calories and/or protein provided by your favorite type of milk. 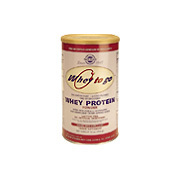 Whey To Go Protein Powder Natural Chocolate Cocoa Bean Flavor is shipped in a discrete, unmarked package. Orders are processed immediately and usually take about 3 to 5 working days to be received. We do ask that you try it for 2 to 3 weeks to feel the full effects. Any information received is used only for order processing and shipping purposes. Your information, such as e-mail address, will never be disclosed to a third party.